WARNING: The following article contains SPOILERS for Disenchantment. Fans of Matt Groening's work will not be surprised to learn that Disenchantment - the new fantasy series Groening created for Netflix - contains a number of Easter eggs and references to his earlier work. The early seasons of The Simpsons often made reference to Groening's comic strip Life In Hell, and the sci-fi comedy Futurama also paid tribute to Groening's past creations - even before an official crossover was arranged between Springfield's favorite family and the employees of Planet Express. To that end, we've attempted to inventory all of the subtle nods and sight-gags in Disenchanted that pay tribute to the earlier animated series and comics - from familiar wigs to a potential shared universe. The second episode, "For Whom The Pig Oinks," sees Princess Bean chatting with her new fiancé, Prince Merkimer, while he is trying on new wigs. A hair-piece based on Futurama protagonist Philip J. Fry's famous "do" can be clearly seen on the shelf behind Princess Bean. A wig based on Lisa Simpsons' hair is hidden with more care, but can be seen directly behind Luci The Demon's tail. Introduced in the episode "Two Cars In Every Garage And Three Eyes On Every Fish," Blinky the Three-Eyed Fish became something of a mascot to The Simpsons during its early seasons. The piscine mutant brought down Mr. Burns' effort to run for governor, after his claims that the the fish altered by the radiation emitted by his nuclear power plant tasted great were put to the (taste) test. In the end, Mr. Burns proved unable to swallow his own fish story. 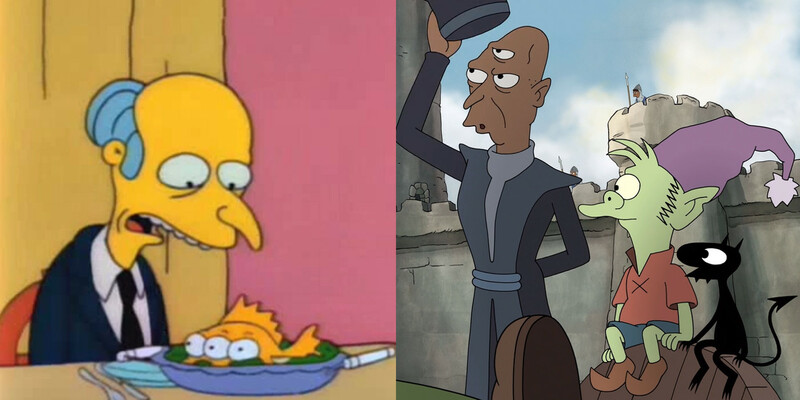 Blinky went on to make a number of cameos in Futurama, but is only mentioned by name in Disenchantment. The fourth episode, "Castle Party Massacre," reveals that Dreamland 's Prime Minister Odval has a third eye in the middle of his forehead, which is usually kept hidden by his ceremonial hat. When Elfo discovers this, he decides to name the eyes, calling them "Winky, Blinky and Soul-Stealer." The dour Odval, unsurprisingly, is not amused. As Princess Bean, Elfo and Luci flee Bean's wedding in the first episode and enter an enchanted forest, an owl can be heard hooting ominously as it swiftly swoops downward. The owl has three eyes, marking it as one of the dangerous magical animals that are said to be inhabiting the forest. This is another nod to Blinky The Fish from The Simpsons, but is also a reference to Futurama, where owls supplanted pigeons and rats as the major urban pest of New New York. The seventh episode, "Love's Tender Rampage," sees Elfo attempting to cover his crush on Princess Bean by making up an imaginary girlfriend. In his desperation to describe a woman other than Bean, Elfo describes his girlfriend as living in a far distant land nobody has ever heard of, being an orphan and having one eye. Luci the Demon scoffs at this, sarcastically saying that Elfo's description of a "super-hot, one-eyed girl with a dead family" sounds totally legitimate. And yet it sounds like a pretty good description of Turanga Leela - the female lead of Futurama. King Zog has two servants - Vip and Vap - whose primary duty seems to be following him and carrying the train of his cape. Vip and Vap are identical twins and of a diminutive size compared to the rest of the cast. Though they seem to favor berets to fezzes, one can't help but notice a faint resemblance to the characters of Akbar and Jeff from Matt Groening's comic-strip Life In Hell. Futurama and Disenchantment Share A Timeline? Disenchantment saved its biggest Easter Egg for last, with the final episode seeming to suggest it takes place in the same universe as Futurama. As Luci uses a crystal ball to show King Zog images from past events, we see a brief flash of Fry, Professor Farnsworth and Bender in The Professor's time machine from the episode "The Late Philip J. Fry." Are there any other Matt Groening related Easter Eggs that we missed? Let us know in the comments.